So I'd been really keen on traveling into China via ground. Somehow the idea of arriving to Beijing by plane just didn't have the same special feeling. Of course, neither did paying $320/ea. As a result, we decided to take the train from Hanoi to Beijing. The train runs twice a week and takes somewhere between 40-48 hours in total. Not being sure what to expect (other than a long haul), I decided to do a running diary. So here we go! 6:30 pm We're off and running. Settle in to our home for the next four hours (we change trains at the border b/c they are on different gauge sizes). Becca is pretty disappointed because the train is much grimier than the Reunification Express that we rode up from Ho Chi Minh City. 6:40 pm Meet our two roommates; a Vietnamese fellow who immediately goes to sleep and Terrill Lee Graham. Mr. Graham evidently has spent the last two years trying to convince foreign powers to join in denouncing President Bush for various illegal activities as well as make the effort to impeach him now. Of course, he also mentioned that he was "chased out" of LA, had a 3 million dollar lawsuit filed against him, and was full of all sorts of interesting conspiracy theories. Needless to say we shifted to our books (we'd packed 4) post haste. 8:50 pm Stomachs are growling so we prepare the first of many gourmet meals on the train. Thank god for ramen. 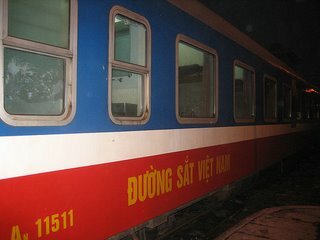 10:30 pm Arrive in the Vietnamese border town of Dong Deng. Pile out of the train with our bags to the border. 11:20 pm Board the newer Chinese train. Much swanker facilities complete with frilly edges. The only downside is that now Becca and I are both top bunking it which limits the sightseeing potential. 11:50 pm Finally leave Dong Deng. Off to China! 12:10 am Arrive at the Chinese border post. Of course we wouldn't know as we're required to stay in our compartments. 12:15 am Fill our various forms for entry. Included in this is a health form listing potential symptoms (check if you have a 'sore throat' 'cough' 'sniffles' etc) that leaves us wondering how long we can hold our breath while dealing with the border guards given Becca's raging sore throat and our wracking coughs. 12:30 am The Chinese Military Border Guard comes by and grumpily takes our passports. We continue to hold our breath, fearing that a mere cough might lead to our imprisonment. 1:54 am We FINALLY get our bloody passports back. Thankfully they're actually stamped and we quickly get ready for bed. By the time we're tucked in and the train pulls away, it's 2:20 in the morning. (Actually, at the border we crossed into the Beijing time zone so it's actually 3:20 in the morning.) It'll be nice to sleep in till whenever. 6:33 am Becca wakes me to inform me that the Chinese train porters have informed us that we have to get off the train in Nanning. Given the fact that we've gotten a whopping 3 1/2 hours of sleep, Becca is looking quite surly. 6:55 am Welcome to Nanning! Or at least a sterilized white colored waiting room with plush seats. Mr. Graham leaves us in search for a monastery who's location he's not entirely sure about. 7:11 am We find out that the train doesn't leave until 9:51am. Decide to take a walk after seeing our first bat in China flying around the room. 8:00 am After some brief exploring realize that nothing is really open yet or wishes they weren't (except for breakfast soup stands) and decide against a field trip to sample dog hotpot. Head back to the waiting room. 9:18 am Led back on the train by our ever present guide. They must have finally finished searching our bags. Pass a huge pack of people waiting to get on the same train in another waiting room. 9:19 am The train musical selection starts with Richard Marx's "Waiting for you" Ugh. Doesn't even faze Becca as she collapses back into bed. 9:24 am Musical selection swells to "Say you, say me" by Lionel Richie. New psychological torture perhaps? 9:33 am "Take my breath away" from Top Gun and then a Stevie Wonder tune play as background music for some official announcement. I'm about ready to throw myself out of the window and go find that dog hotpot. 9:50 am FINALLY leave Nanning! 9:51 am Becca goes down for a "nap"
11:00 am The intercom entertainment system (which this entire time has been going at ear splitting levels) continues with some sort of Chinese comedy routine. Or so I'm guessing by the random fits of laughter. Included in this is children's books being read in English. 2:00 pm Finally wake up. Check out countryside which at this point is wet and brown. 2:40 pm Pit-stop in Guillin. Grab two noodle bowls which look remarkably similar to the two noodle bowls we had the night before. At least these are fresh and are lacking massive amounts of MSG. 3:45 pm Becca locates volume control. Bully! 5:35 pm An unexplainable PBR siting in the food car. Two cases worth. Somehow in the shock I fail to order what would have been my first US beer of the trip. 6:34 pm New arrival for our fourth seat. A stylish Chinese gentleman in a three piece suit ruins my lower bunk view. 6:48 pm Three piece suit guy has disrobed into a one piece set of 1800's goldrush PJ's and heads off to sleep. Our other roomie remains in his continually comatose state. 8:30 pm Stop in unknown town. Three-piece guy continues to try to sleep in amongst the 20 text messages he's received. As a bonus it's accompanied by an annoyingly catching ring tone. 8:55 pm Drink tray passes by. Complete with more PBR. Maybe I'll have one for breakfast. 8:56 pm Another train employee comes by with necklaces and other trinkets. Our Vietnamese roommate finally stirs and seems to be buying something for his girlfriend. 10:40 pm Bedtime. A VERY long day finally comes to an end. 7:40 am Wakeup. Promptly fall back asleep. 8:40 am Wakeup #2. Realize that at some point during the middle of the night Three-Piece guy has gotten off the train. Guess that explains his early bedtime. 10:10 am Vietnamese roommate wakes up. I'm continually amazed at how easily and for how long folks in SE Asia can sleep. Just phenomenal. 11:30 am More instant pho for lunch. We'll be very happy to be out and consuming some non-MSG food. We also arrive at our last stop before Beijing. 12:47 pm Nothing but empty fields and trees praying for spring. Working on getting my Mandarin vocab up to 5 words. 2:08 pm Start rolling through the outskirts of Beijing. We are immediately shocked by actual multi-lane highways with stoplights that drivers actually use. That and the endless high-rise apartments. 2:20 pm Arrive in Beijing West train station, nearly 44 hours after departing from Hanoi. We're feeling particularly good as our sleep deprivation happened earlier in the trip. From there we're able to successfully get $, avoid the dodgy private cars and get a cab out to the Dolans, friends we met while in Siem Reap. We also quickly learn that we need to start getting a handle on Mandarin and quickly. Very little English is spoken and the expectation is Mandarin first and foremost (We were chastised by the cab driver for having the Dolans' address writen in English, though to our credit we did have a phone number to call for him to call for directions in Chinese). Over one billion people can't be wrong, eh? In closing, the train trip was pretty painless especially compared to what we anticipated. It was long but outside of the initial hassles at the border it was pretty uneventful. And now I'm on the hunt to find PBR again; maybe on our next train ride I'll finally be able to PBR me ASAP.